The shooting spree at Utoya Island which cost 87 lives is the worst tragedy to hit Norway since World War II, Prime Minister Jens Stoltenberg said on Saturday. 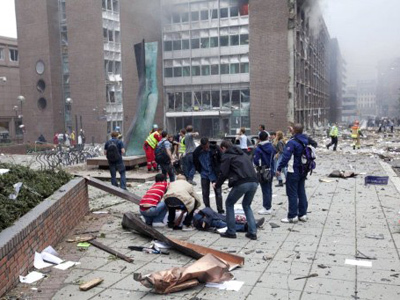 The massacre followed a bomb blast in Oslo which killed seven, bringing the toll to 94. 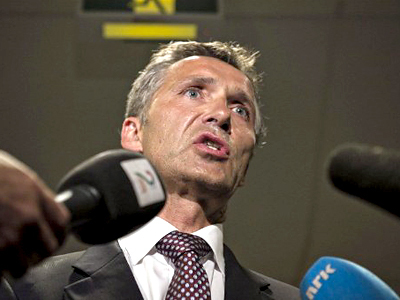 Prime Minister Jens Stoltenberg gave a press conference in the wake of Friday's bomb blast and the shooting massacre in which a gunman disguised as a police officer opened fire at people mostly between 15 and 25 years of age, who had gathered at the Labor Party’s youth camp, about 20 miles northwest of Oslo. “What hurts most is that this place where I have been every summer since 1979, and where I have experienced joy, commitment and security, has been hit by brutal violence -the paradise of my youth has been transformed into a hell,” the Prime Minister told the press. The Prime Minister had been due to arrive on the island on Saturday to address the gathering. "Many of those who lost their lives were persons I know. I know the young people and I know their parents," he told the news conference. He has described the attacks as a “nightmare and national tragedy”. Police have already arrested and questioned the 32-year-old suspect, identified by the media as Norwegian Anders Behring Breivik, over both attacks. The suspect has already been charged with both the Oslo bombing and the Utoya shooting. The suspect has been charged with Paragraph 147 of Norway’s Civil Penal Code which deals with terror activities. It allows a maximum prison sentence of 21 years, which is the longest jail term permitted under Norwegian law, the police told journalists at a briefing on Saturday. The suspect's motive is unknown, but both attacks were in areas connected to the ruling Labor government. However, the police say the suspect is unlikely to be linked to any international terrorist organizations. Anders Behring Breivik expressed right-wing, radical Christian and anti-Muslim views on social networks, according to media outlets. He is also a former member of Fremskrittspartiet, Labor's opposition party, as the party's secretary confirmed on Saturday. His Facebook page was taken down on Friday. According to the TV2 channel, Breivik had two weapons registered in his name. Breivik is also reported to be registered as having run a company which produced vegetables, melons, roots and tubers. His industry would have allowed for access to large amounts of fertilizer, which can be used for explosives. Felleskjopet, a farming-supply company whose employer identified Breivik, confirmed the man bought six tons of fertilizer late this past spring. 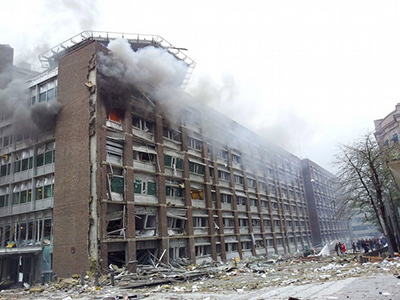 First it was suspected that Norway’s involvement in NATO’s military operations could have motivated the attack, but this notion was brushed aside after Breivik was detained. Meanwhile, eyewitnesses who spoke with the Norwegian newspaper VG are convinced that there were two shooters on Utoya. Undetonated explosives were found on the island and police also warned the capital’s residents to stay home as there could be more explosives hidden in Oslo's city center. 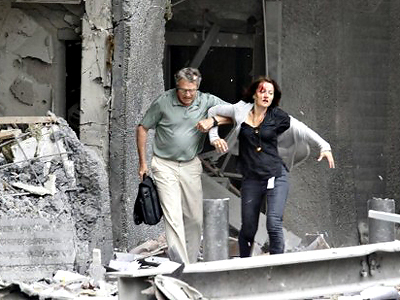 Four out of the seven people killed by the blast have already been identified. Nineteen more remain in hospital, two of them in a serious condition. 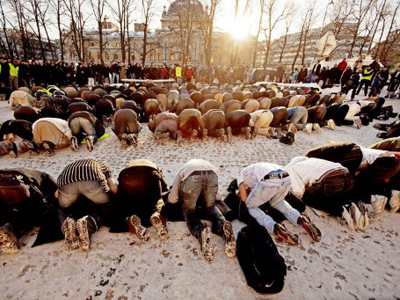 Oslo is still paralyzed over the tragedy. Friday’s bomb victims are returning to the scene of the explosion to look for trapped people despite their own wounds and the risk of further blasts, reports RT’s Daniel Bushell. Many central streets are walked only by emergency workers, reporters and random volunteers. Shops are closed; museums and theatres in the city centre have sent staff home. Two major concerts scheduled for Saturday in the capital’s downtown area have been cancelled. However, Itar-Tass news agency reports the tension is easing off, with several areas of the city re-opening to traffic. Norway will restore border controls for the Schengen nations, say the Norwegian authorities, adding this is a temporary measure due to Friday’s tragedy. However Justice Minister Knut Storberget told a press conference there was no reason to raise the threat level in the country. ­There has been widespread international condemnation of the attacks, which have claimed the lives of at least 90 people. German Chancellor Angela Merkel expressed her nation’s solidarity with the people and government of Norway. Cameron added that these attacks are “a stark reminder of the threat we all face from terrorism,” and offered Britain's help, including close intelligence co-operation. 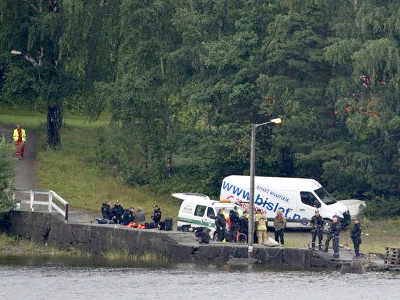 Russian President Dmitry Medvedev, Prime Minister Vladimir Putin and the Ministry of Foreign Affairs expressed their condolences to Norway over Friday’s tragic events in Oslo and on Utoya Island, with President Medvedev sending telegrams to both Norway’s King Harald V and Prime Minister Jens Stoltenberg, the Kremlin’s press service reported on Saturday. Moscow residents have been bringing flowers to the Norwegian embassy since early Saturday morning. US President Barack Obama also extended his condolences to Norway's people and offered US assistance with the investigation. Words of solidarity have also come from Britain’s Queen Elizabeth II, Italian Prime Minister Silvio Berlusconi, Australian Prime Minister Julia Gillard, Latvian President Andris Berzins, Georgia’s Foreign Affairs Office and many others.